Description of "Practical Risk Analysis for Project Planning"
Projects are investments of resources for achieving a particular objective or set of objectives. Resources include time, money, manpower, and sometimes lives. Objectives include financial gain, social and health benefits, national goals, educational and scientific achievements, and reduction of suffering, among many others. Projects are undertaken by large and small organizations, by governments, non-profit organizations, private businesses, and by individuals. Determining whether to execute a project, or which project to execute among a set of possibilities is often a challenge with high stakes. Assessing the potential outcomes of a project can therefore be detrimental, leading to the importance of making informative decisions. Practical Risk Analysis for Project Planning is a hands-on introduction to integrating numerical data and domain knowledge into popular spreadsheet software such as Microsoft Excel or Google Spreadsheets, to arrive at informed project-planning decisions. The focus of the book is on formalizing domain expertise into numerical data, providing tools for assessing potential project performance, and evaluating performance under realistic uncertainty. The book introduces basic principles for assessing potential project performance and risk under different scenarios, by addressing uncertainty that arises at different levels. It describes measures of expected performance and risk, presents approaches such as scenario building and Monte Carlo simulation for addressing uncertainty, and introduces methods for comparing competing projects and reducing risk via project portfolios. No special software is required except Excel or another spreadsheet software. While the book assumes no knowledge of statistics, operations research, or management science, it does rely on basic familiarity with Excel. Chapter exercises and examples of real projects are aimed at hands-on learning. Visit www.riskanalysisbook.com for more information about the book. Galit Shmueli is the SRITNE Chaired Professor of Data Analytics at the Indian School of Business. She is co-author of the textbook Data Mining for Business Intelligence and the book Modeling Online Auctions, among several other books and many publications in professional journals. She has been teaching courses on forecasting, data mining and other data analytics topics at the Indian School of Business, University of Maryland’s Smith School of Business, and online at Statistics.com. Visit www.galitshmueli.com for more information. 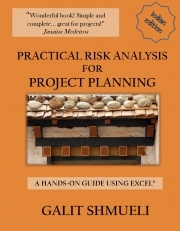 Reviews of "Practical Risk Analysis for Project Planning"